This past weekend, our neighborhood Ralph was giving away free eggs–a carton of 18 large eggs. Being the cheapo shopper that I am, I didn’t pass up the opportunity, of course. I have always loved eggs and I do shop at Ralph, plus more eggs mean I can experiment with some baking and make my favorite egg dishes such as this and this. Anyway, these son-in-laws eggs are very good eggs. 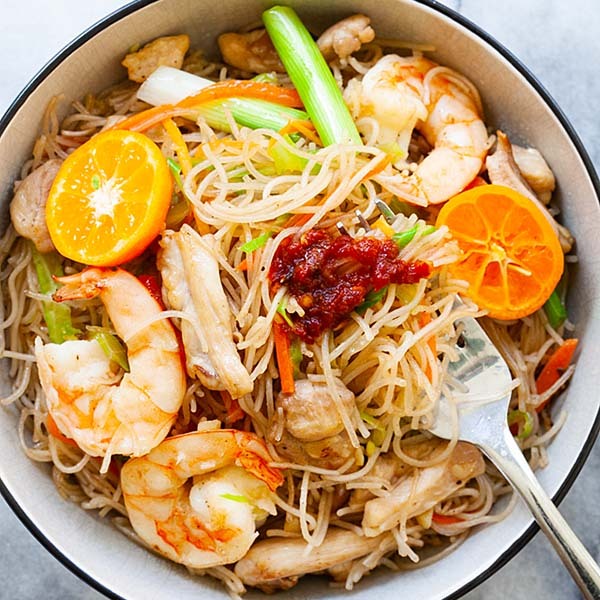 It’s a simple dish with lots of flavor–tangy, savory, syrupy, and a little spicy. 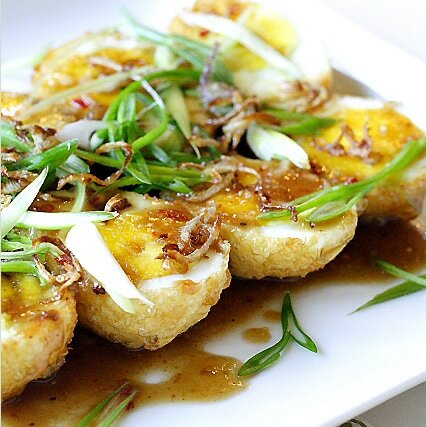 The taste is similar to my Malaysian sweet and sour eggs, but the eggs are first hard-boiled, deep-fried, and then topped with tamarind sauce. As the main ingredient of this post is eggs, I am entering this to CLICK: Oct 2007 Food Photography event hosted by Jai and Bee. Deep-fried the eggs until the skin turns brown. Dish out and slice into halves. Arrange them on a plate. Deep fried the shredded shallots until golden brown, remove and place on paper towel to absorb oil. Heat up a sauce pan, pour in the oil and saute the minced garlic until light brown. Add the dried chili flakes, ground peanut, do a quick stir, and follow by the tamarind juice, palm sugar, and fish sauce. Bring it to boil and pour the sauce on top of the eggs. Top with fried shallots and scallion/cilantro. 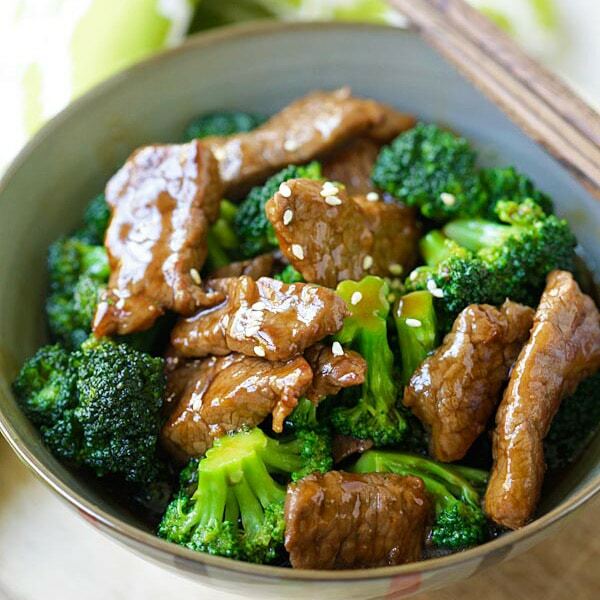 Serve hot with steamed white rice. Thai Cooking Made Easy (written in both English and Chinese) is a practical cookbook for Thai food. I have tried many of the recipes on the book and love the authenticity and flavors. A must-have for people who love Thai food. Buy now! Ahh…remind me of Foochow style birth day. Ah Mah would cook 長壽麵 and drop in a Deep fried hard boiled eggs. Just wanted to say your son-in-law eggs look absolutely divine and I can’t wait for recipe (shall be checking every half an hr hehe). Would this be eaten as a side dish to rice? what an interesting name. this looks delicious! Wow, another dish I’ve never heard of and cannot wit to try! I’m so curious about the name. Ha! I sense gender discrimination as well! ralph gave away free eggs? how come i didn kno abt it? arrgh! hard-boiled and deep-fried? it looks and sounds like such a decadent dish. Reminds me one of the Malay dishes… eggs are deep fried too. i think the OG recipe had quail eggs or maybe not ! Even i’ve always wondered why son in law eggs…maybe when the lady who invented these , made a lot and her hungry hog of a son in law wolfed them all down.Hence the name :p what do you think ??? I love this egg dishes! One of my favourite Thai food! Nice photo. This looks and sounds tasty. And I just saw some palm sugar at a store the other day so I should be able to get all of the ingredients. Bookmarking to try later. Cooknengr – oooh, is it. That’s the first time I heard. Interesting. Cenedra – the recipe is posted. Yep, you eat this with rice. It’s delicious. K&S – yeah, the name is very interesting, I would love to find out why is it called son in law eggs though. Hehe. Tiga – wow, tamarind prawns, I want I want. Quickly post your entry. Lydia – yeah…am curious about the name I wonder if Chez Pim knows. It’s a great dish, a must try. East Meets West – cool, thanks. Princess – yeah, you don’t get the coupon? I got another one again, am going to get more, whahahaha. Marvin – yep, try it, it’s the best. WMW – yeah. Eggs, anytime! Kate – maybe. Or maybe the son-in-law is trying to win the hearts of the in-laws and cooked these eggs a lot? Whahahha, I dunno. Anh – correct, one of my fav Thai dishes too. So simple yet decadent. I’ve heard a few different stories about the name. The most common is that a son in law was trying to cook something for his mother-in-law to be, when she was coming over to meet the family. All he knew how to cook was boiled eggs, so he came up with this dish. Another story is.. well… ‘egg’ in Thai (khai) is slang for a certain part of the male body (they have two! ), and perhaps mom wasn’t so fond of her daughter’s husband? Wuahahahah! What a name for a dish. Sounds very southbound. Hahahahah. haha. love this version of yours. Surprisingly, I haven’t had this yet. Something to try out. oH, and I love eggs too. Most versatile item in the fridge. I love boiled eggs – I add them to any stew I can make . Regarding your baking skills – I started with brownies first unless you don’t like chocolate we could think of something else for you to make. Oh..Bee – it’s the beginning of October – I shall remind you again before you leave – Bak-kut-teh! The eggs look yummy! The sauce must be appetising, with tamarind and fish sauce as ingredients! Yes! Yes! Yesssssss! This is freaking-crazy good! They look great. I think I’ve only had these eggs once. Could be time to try them again (in the restaurant; I don’t deep fry at home). those eggs are indeed beautiful, no wonder all these people here are so nuts about them. My friend Jai and Bee are hosting their CLICK event, this month, it is Eggs. You should definitely send in yours ;-) I am sure they would be thrilled! Wow, those sound great. I love trying new egg dishes so I will definitely give this one a try. RM, this is one of those dishes that takes over me. I get so happy when I see any kind of hard-boiled egg… chinese brown eggs (lu dan) and these. My dad got me hooked on these (laotian/thai) and I make him order these for me whenever he goes to pick up thai food. Again, great job on photos/execution. I wanna try this very soon, and maybe a version w/ some sichuan peppercorns. Wow, great, got one more egg recipe. I love deep fried hard boiled egg. I love deep fried hard boiled eggs with sambah. Like you, I love eggs. It’s like the perfect food in a shell. This is one cool recipe for eggs!!! Nice pic too. Is palm sugar the same as gula melaka? 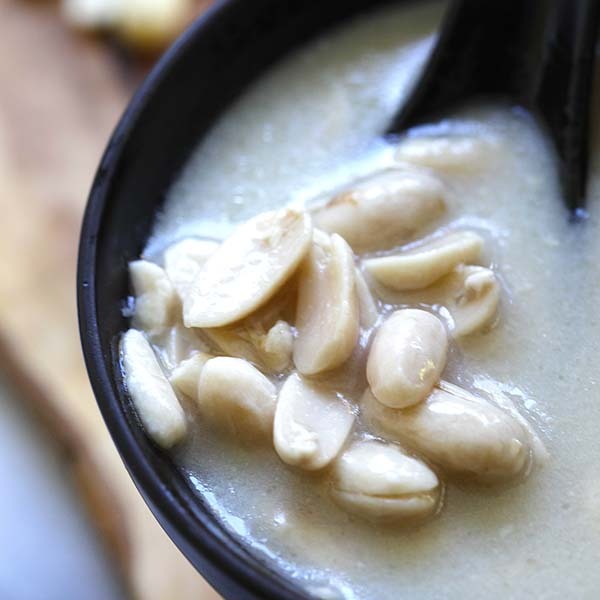 Where do we find gula melaka in Southern California? Thanks! photo is great!! recipe sounds pretty good! thank you for your recommendation for the thai cookbook! Yes.. everything in the world is about gender, unless its male bashing because thats just funny.. right? I can’t wait to cook this dish. I had this dish a few years ago at my sister-in-law’s house, but I just didn’t know what it was called or how it was made. Thanks for sharing! You have very unique and interesting recipes! Hi !! first time on your blog and I am so happy to find all these wonderful recipes and amazing snaps you have posted. One more thing is the name of your blog “Rasa Malaysia” wow that is like a very beautiful name , sounds like those exotic place names :) Very good blog and very good writing and photos!! Anyway, thanks for the recipe. Keep up the good work, Bee. I’ll keep coming back for the next posts. How this recipe got its name?hehe..btw, tried it today.looks like the pic :) but mine with extra gravy..simple & delicious! hi lin!! i cant thank you enough for sharing this wonderful recipe :) i have done this a couple of times already and it never fails to catch a compliment. i am a filipina and have been exposed to different kind of cuisines :) but mind you, i cant cook before hahah! now that i am married and live away from home, i rely on the web for recipes and im so happy that i bumped into your website while getting recipes from http://www.pinoycook.net :), and i have to cook otherwise my hubby and lil monster would end up eating take-aways hehehe anyway, thanks so much for sharing unselfishly! cheers to simple, home-made and delicious cooking!!! Leng – thanks for loving my recipes. Yes, this son-in-law eggs are absolutely delicious. is there any subtitute for plum sauce? hi there, surely like the others i would say that this looks good. But i was wondering if we can apply the tamarind sauce with others stuff. I often ate at “malay village” the serve deep fried enoki & deep fried kangkoong with sum kinda sauce that taste sour and a bit spicy, was it the same like this one?? I came across your post and you were wondering why this dish is called “Son-in-law eggs”? haha… I read in a cookbook once. Apparently, this dish is one of the simplest dish there is for a potential son-in-law to impress his future in-laws with. He can prep this dish and have low risk of failure and yet impress his future in-laws with its beautiful presentation. Hi there, I often eat this from my local takeaway here in Melbourne, its also in a cookbook I own. The name comes from the dish’s origin. It was apparently made for the first time by a guy when his future mother in law was coming for dinner with him and his soon to be wife, he wasn’t much of a cook so boiled some eggs, fried them and combined them with a typical Thai sauce using classic Thai ingredients. He was obviously succesful as they are not “ex-boyfriend eggs” or “stupid man eggs”! Anyway, thought I’d contribute that, great blog, I’m on my way back to South East Asia in November and cannot wait. 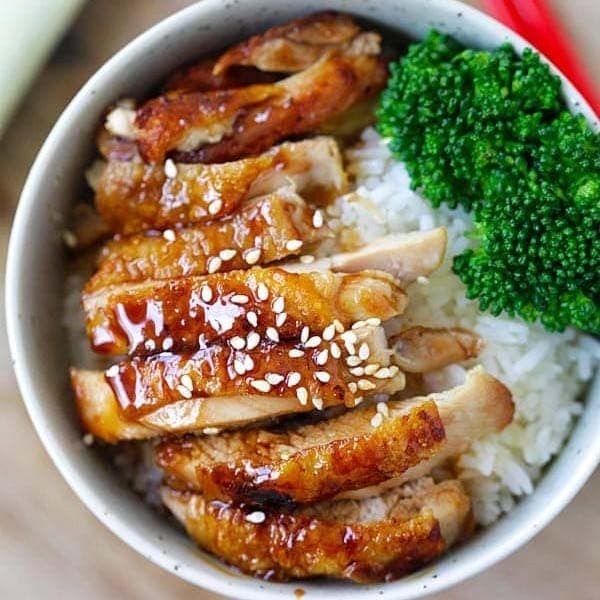 This receipte also look very interesting and easy. Please let us have the DAUGHTER IN LAW egg receipte. Wish to compare the difference. Please I wish to prepare a VERY CRISPY slice oyster . Kindly see if you can help. Very interesting. I saw this on the Master Chef Australia program on telly and was tempted since then. Want to try it soon. Only difference was that they were going on and on about the eggs being cooked to runny consistency when they are cut for eating. Wonder if any one else came across this and how does that compare with the hard boiled version. I heard somewhere that it was son-in-law eggs because they are so good that it will keep your son-in-law happy (stay a happy faithful husband)! My favourite dish… might have to pop my chicken back in the fridge and opt for eggs tonight! They are called son in law eggs (kai luk koei) because it’s the story of when a man was making dinner for his father in law and was late so couldnt cook anything grand and the only food he had was eggs so he quickly made this and his father in law loved it… that’s the story i was told anyway! My mother is Thai so i hear all the stories and enjoy Thai food most nights of the week :D bonus!